The town of Old Fort is known for its arts and crafts history, its railroad history, and, prior to all of that already great history, it was known for being the westernmost outpost of colonial America. It’s where a group of North Carolina colonists organized a battle against the Cherokee during the Revolutionary War. Led by General Rutherford, the colonists gathered at Davidson’s Fort (constructed on land owned by Samuel Davidson…more about him at our Intro to Davidson’s Fort blog entry). And we hear that this well known fort gave the town of Old Fort its name. We’ve enjoyed reading about the reconstruction of Davidson’s Fort by a dedicated group of local residents, who have been working hard on the fort for a few years now. Recently, due to current economic conditions, some tough decisions have been made recently with regard to the fort, but the Davidson’s Fort crew is just as dedicated as ever to getting the fort built and open to the public. They are at the fort every single Saturday starting at 8am. Over the past several weeks, what has been constructed so far has been moved to a new location. And the rebuilding continues. Work has already been done to create Overlook Hill, which will provide a backdrop for viewing Davidson’s Fort and will be the area where donor bricks are displayed. The finish line is close — Davidson’s Fort is scheduled to be finished by this Thanksgiving. The fort will be 100×75 feet with a 20×24 foot welcome center/block house at one corner. 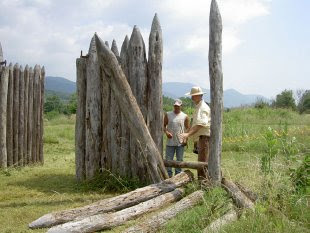 To learn more about Davidson’s Fort or to contribute, visit www.davidsonsfort.com. You can also check the website for their weekly progress reports. And if you’re a nearby resident and can volunteer your time on a Saturday to help with construction efforts, contact Debbie Acrivos at 828.442.6601. We will hopefully get out to the fort on a Saturday in the near future to take some photos of the progress being made.